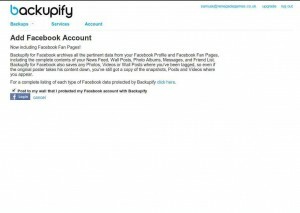 Backupify is an interesting service that lets you backup your Google Apps, Salesforce and other social media accounts. It is a young company in a young industry, but definitely a worthwhile service to try. Free account feels limited but you should definitely start there before you jump in and start paying. 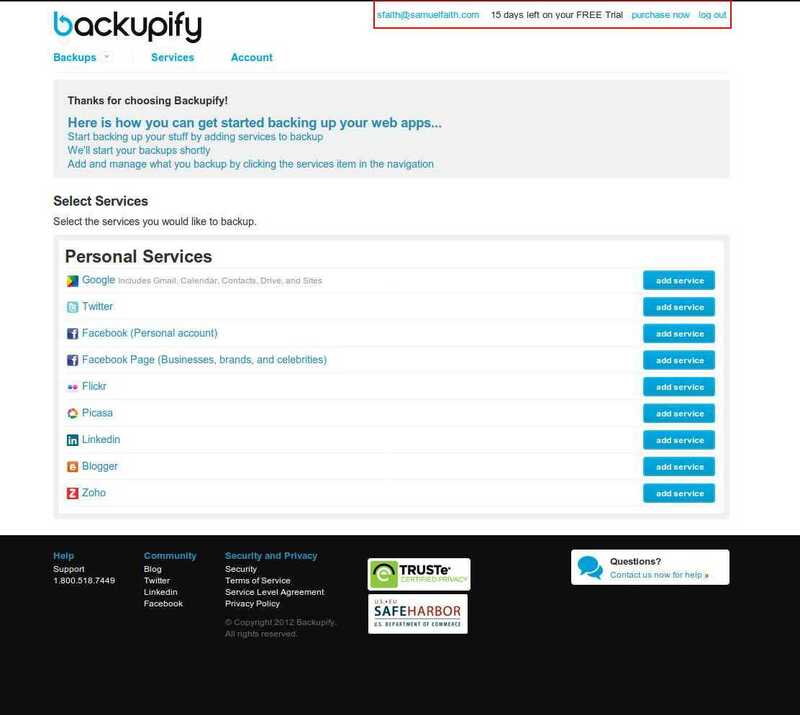 To backup many of your social media accounts into one backup service, Backupify is something you should really give a try. Read on for more details, or you can sign up now. How many of you have a social media profile and a Gmail account? Wait, don’t answer that question. How many of you DON’T have any account on social media sites like Facebook or Flickr, and don’t use Google Mail? Now, that’s easier number to deal with. Because the answer is literally zero (unless some of you have been living in the caves for the past decade). Our lives are now curated and collected on the cloud across several social media sites like Facebook, and we are increasingly dependent on using email for our communication. Google Mail is one of the most popular, and many of us are relying on it for both our personal and business communication needs. Our photos are stored on Flickr and Facebook. Heck, do we even print out photos anymore? Most of us don’t. With all that uber reliance on digital space to store our memories and lives, there is a risk associated with all that. What if our Facebook account gets hacked or removed by Facebook for some reason? What if we accidentally delete some albums on Facebook and Flickr and lose all photos stored there? There was even a case of Flickr accidentally removing a guy’s photos. He got his photos restored, but will we be that lucky? Whatever happens, all our precious data will be lost. Forever. With that services to backup our social media accounts and Google Mail have emerged, and Backupify is one of the leaders in the space. Let’s take a look after the break to see how it fares. Actually, Backupify can do more than backing up your social media accounts and Google Mail data. 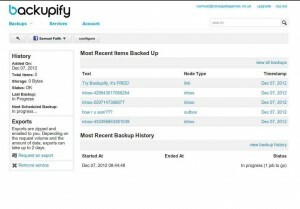 In fact, Backupify has whole range of cloud-based backup service for both Google Apps and Salesforce users, primarily SMEs and enterprises. We will be exploring pricing plans for all services from Backupify here. All Google Apps backups will backup the following services: Gmail, Docs/Drive, Contacts, Calendar and Sites. Following are pricing plans. With this account type, you will get 35GB of storage space per user, and it comes with following features. 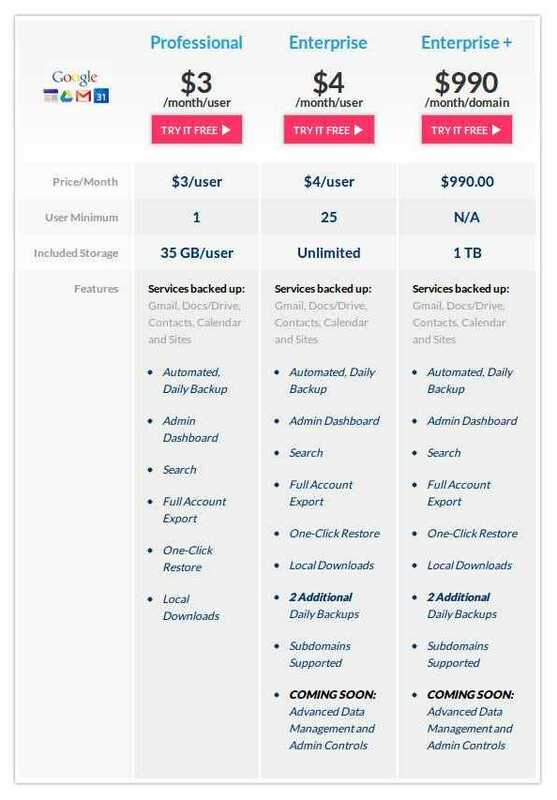 You need minimum 25 users to subscribe for Enterprise plan, and it will give you unlimited storage space per user so that you can backup to your heart’s content. The following features will come with this plan. If you have a lot of users but can do with just 1TB storage space for backup, then Enterprise+ plan is definitely for you. It comes with all same features from Enterprise plan, but instead of paying per user, you pay per domain. This is useful if your Google Apps users don’t use so much space. 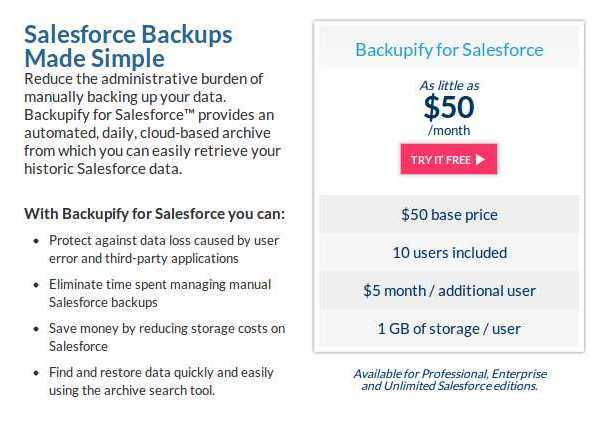 For Salesforce users, Backupify provides backup service with $50 per month base price, which includes 10 users and 1GB storage per user. For additional users, it’s only $5 per user per month. With Backupify service for personal social media apps, you can backup the following applications. There are three plans currently available. You can add up to 3 social media services to backup, and the plan comes with 1GB storage space. Backup frequency is weekly and you can only get web-only support. 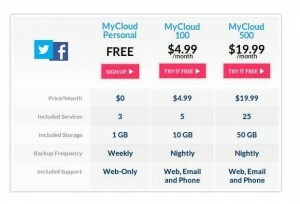 MyCloud 100 plan is more suitable for people with a lot of things on their social media accounts to backup. With this plan, you can backup up to 5 social media services and also get 10GB storage space. Backup frequency is nightly so you don’t have to worry about losing data, and you also get email and telephone support on top of Web-based support. MyCloud 500 is for those with huge loads of data on the cloud. You get to backup up to 25 social media accounts and also get 50GB of storage space. The rest are the same with MyCloud 100. There are a lot of features to talk about, actually. But since most of our readers are personal users and small business owners, we will be mainly discussing about the features from backing up personal social media accounts, as well as general features that are available across all solutions. Automated Daily Backups. All backups are automated and they occur automatically every day for paid plans (all services) and every week for free plans and trials. Local Downloads. After backing up your cloud-based information, you can actually download them to your computer for offline storage purposes. There are many things you can download, such as PDF exports of your Twitter feeds to Microsoft Office versions of your Google Drive documents. And you can download them to a local computer or server. One-Click Restore. Restoring your backup cloud-based information back into your accounts, either Gmail, Google Drive data, Google Contacts entries, Facebook data, and anything else are very easy with just a click. Just click the Restore button and sit back, your data will be returned directly to your accounts. Centralized Management. This is more for Google Apps backup service. 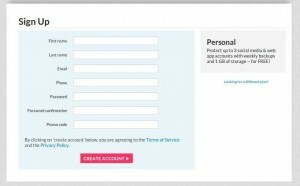 Basically it has all admin tools that simplify adding users, managing archives and initiating restores for your domain. Search. Another powerful feature for Google Apps backup service users. You will get a powerful built-in search bar in your dashboard which allows admins to find emails and documents among backup data. Cloud Storage. Although Backupify has their own infrastructure for processing and all those stuffs, but all files are stored in Amazon Web Services (AWS), which is known to be subject to the highest security and reliability standards in the world, and uphold a 99.9% uptime. Many of today’s cloud services are built on top of Amazon Web Service so you can be sure that your data at Backupify will be safe. Backupify takes security very seriously. There are several security measures they put in place to ensure that every data you backup to Backupify is safe and sound. Backupify won’t just use Amazon’s built-in bucket-level encryption, but go far beyond that. When you backup with Backupify, it will encrypt all your online archives. And every account Backupify backups will get a unique AES 256-bit encryption key, then all data on that account will be encrypted with that key before storage. When a user views or downloads backup data through Backupify web interface, the account encryption key will be used to decrypt your stored data. Those AES keys are stored on Backupify’s central servers and all those list of keys are encrypted with Backupify’s master key which follows RSA-2048 encryption standard. All user interactions with Backupify web application – from logging in, configuring services, changing settings, to accessing backup data – all occur through a securely encrypted channel (SSL) using 256-bit encryption. All data transmissions between Backupify and third-party APIs – such as Google Apps domain, Salesforce API or other social media services, will happen over SSL encrypted channel with 256-bit encryption. Finally, for all data stored on Amazon S3 are encrypted using AES-256 bit encryption key unique to each accounts. Although Backupify is pretty new service, the customer support team is actually quite active. Free accounts only receive web-only support which include web-based ticketing system as well as videos. However, for paid users, you will receive telephone and email support as well. From our research, Backupify customers seem to be quite happy with their current customer support service level. They actually responded to our queries in very short time frame (usually within 3 to 4 hours). Now let’s get our hands dirty and follow though the process from registration to actually using Backupify. For this, we will only be trying out their Backupify for Personal Apps service since most of our audience here are personal users. We will be doing another tutorial soon on how to use Backupify for Google Apps and Salesforce. Backupify website is pretty easy to use, and they seem to push Free Trial pretty heavily. 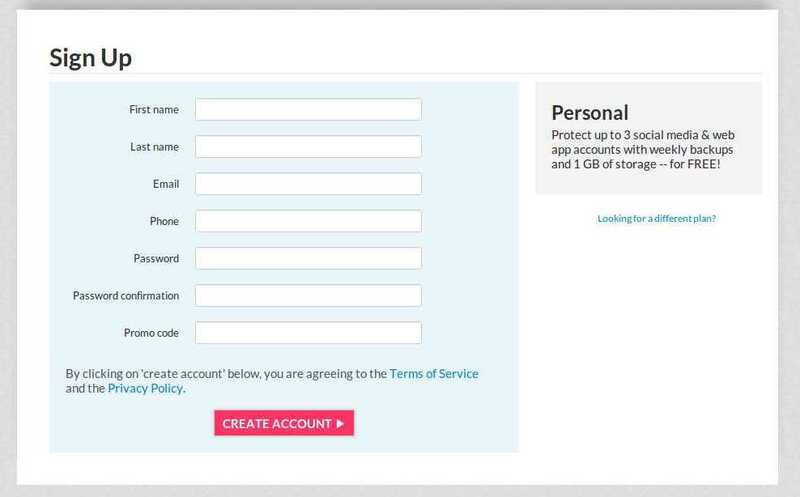 However, for Personal Apps backup, you can even sign up to free account. During the sign up, they will ask for pretty complicated kind of password. But that’s fine, since it’ll strengthen the account security. We just wish that they would put a notification beside password box, not just giving us an error right after we fill in everything and submit. 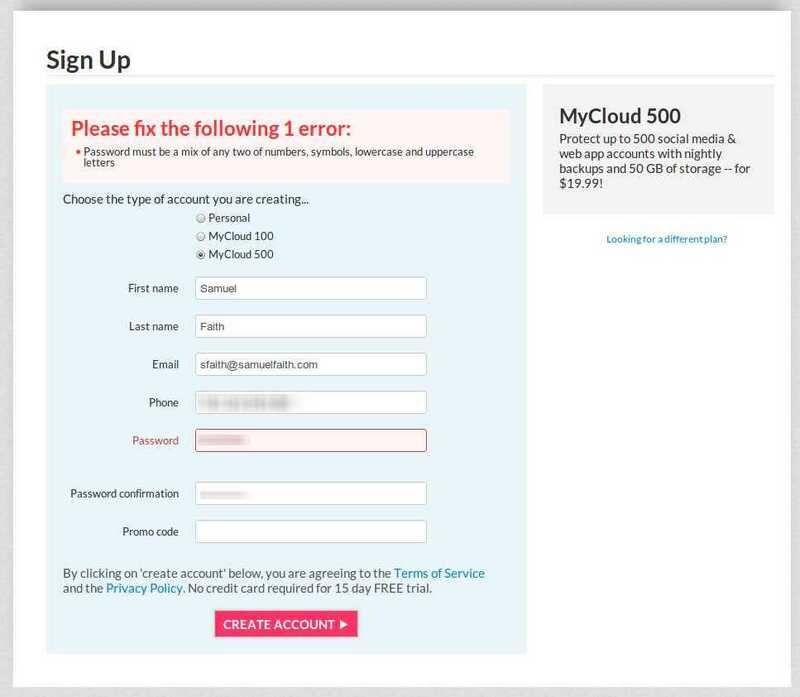 Another weird thing is that initially we chose free plan MyCloud Personal (not even free trial) to sign up, but when the sign up page brought me to another page saying we need to enter more complicated password, the signup was changed to free trial for MyCloud 500 which cost $19.99. What the heck! We only learned it a bit too late after we signed up. And when we tested the sign up process again, it’s confirmed that the plan we tried to sign up is changed to MyCloud 500 during “Enter the password with blah blah blah” page. Annoying! Right, so after the hiccup with sign up stage, we are finally brought to its dashboard, which is where we can add our social media services. The process is actually pretty easy. Regardless of what service we choose, it will use O’Auth kind of token authentication to link your Backupify account to available social media services. So Backupify will never ask for your password (horay for that). We added two social media accounts, Facebook and LinkedIn, to test how Backupify will work. The process is actually a breeze, and there wasn’t anymore issue during the process. Then the backup process is automated for both services, so we just have to sit back and wait. When you click each service, you will see what things are backup from each account. Then you can actually click on each of them to view your backup data. If you want to download, just click on “Request an export” at the left and you will get ZIP file within 2 days. Sometimes it takes quite awhile due to the data volume. We actually don’t get a chance to test restoration since backups aren’t completed. However, according to our interview with some Backupify users, one click restoration promise really works, although sometimes Backupify tends to leave out certain data. The service is still young so we can’t really blame them for that now. Backupify is a young company in emerging new industry. However, there have been a lot of developments with the service as they learn more about what users need. It is a good sign that they evolve along with their customers, indicating that they truly care about their customers. It seems like this industry is still young so there will be a lot of rooms to grow, for both Backupify and its competitors like Spanning. Right now as it stands, Backupify is still a mystery to us. If we want to backup our Google Apps, Backupify won’t be our first choice for now (there are other enterprise-level services), but for personal users Backupify seems to be doing its job. Yet, if you want to remain as a free user, just beware that you will hit a wall sooner or later. There is no way that 1GB and weekly backup is enough for any needs. So be prepared to upgrade. For other social media accounts, there isn’t a lot of choices that allow you to backup all those in one platform. The jury is still out, but it is a worthwhile service to try.